Moving into a new home is filled with unknowns, from how to get around the new ‘hood to figuring out where the closest grocery store is. But one of the intangible features that can really make or break a new home are your neighbors. Having a good relationship with your neighbors can really make you feel more connected to your home and neighborhood. Thankfully, cultivating a good relationship is more an issue of nurture versus nature; with a friendly tone and tending, you can build and maintain a relationship with anyone. That said, now that you’re no longer the ‘new kid on the block,’ it’s your turn to welcome the newest family to the neighborhood. Here are 4 thoughtful housewarming gifts you can bring to welcome the new family to the block. Who doesn’t love special treats? Whether it’s homemade or purchased from a bakery or store, this is a simple way to bring a little sweetness to your new neighbors’ day. No time to bake? Consider bringing frozen cookie dough (with baking instructions) so your new neighbors can bake them up whenever they’re in the mood for a treat. A note of caution: keep the treats simple since many allergies abound these days; for an extra layer of safety, include a list of ingredients. Houseplants are always a nice and simple gift. They’re relatively easy to take care of and you don’t have to worry about matching your neighbor’s décor. Make sure you select a relatively low-maintenance houseplant so your neighbors don’t have to worry about maintaining it. While it’s nothing special, this gift may be one of the most appreciated housewarming gifts. Put together a list of need-to-know information that usually takes a lot of time to figure out (or anything you wish you knew when you moved it) like babysitting recommendations, garbage collection dates, non-emergency numbers for local agencies, your favorite parks, or other places to visit or activities to participate in, and some take out menus of local favorites. It may take a few years to find out all the local gems in your new neighborhood but you can help your neighbors get their footing faster. Grab a takeout menu and a gift card to a popular local restaurant and treat your neighbors to dinner. Sometimes, even the simplest housewarming gifts goes a long way. 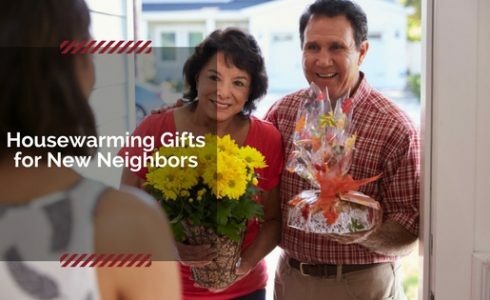 You don’t have to put pressure on yourself to find the “perfect” gift to welcome your new neighbors. A warm smiled and an in-person chat or greeting card is enough to make anyone feel welcomed. There are plenty of ways you can welcome a neighbor to the neighborhood; there’s really isn’t a wrong way to being nice.